Attendees at all the statewide Common Core DESE meetings on May 2 were told the Federal Government didn't have a role in the Common Core standards. ● It has been established CCSS were crafted by the Council of Chief State School Officers and the National Governor's Association, both private organizations, funded by federal stimulus money. ● CCSS could be adopted by states via a Federal waiver given by Arne Duncan to escape from the No Child Left Behind (NCLB) requirements. ● Memorandums of Understanding (MOU's) were signed by Missouri to Smarter Balanced Assessment Consortia to send individual student, teacher, principal data to the consortia....and SBAC consequently signed a MOU with the USDOEd to send data to this federal agency for dissemination and research. What role will the U.S. DOE play? 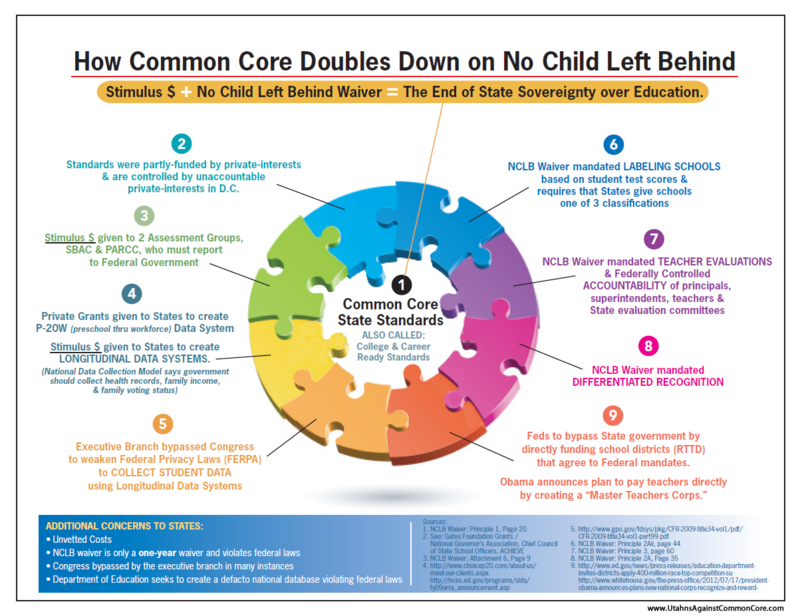 How will states assess the Common Core? Two consortia have been awarded competitive grant funds for the development of tests to assess the Common Core Standards. SMARTER Balanced Assessment Consortium (SBAC) was awarded a four-year$176 million Race to the Top assessment grant by the U.S. Department of Education to develop a student assessment system aligned to a Common Core of academic standards. Partnership for the Assessment of Readiness for College and Careers (PARCC or Partnership) PARCC RttT Assessment Consortium was awarded $170 of the $330 million. Assessments are expected for 2014 and are expected to include results from performance-based tasks through testing and traditional end-of-year assessments. Both plan to include end of year assessments offered online. A significant piece of the CCSSI is the adoption of a common (or comparable) assessment system across the participating states. Supported through $330 million in funding from the ARRA, the Administration held a number of hearings to develop a competition to fund next generation assessment systems aligned to the standards. This competition resulted in two assessment consortia who would lead development efforts for a common assessment of the Common Core Standards. pg. 12...what happens when this Federal money runs out? While the federal government has had no role in the development of the Common Core state standards, according to the CCSSI, the federal government may have the opportunity to support states as they begin adopting the standards. of existing federal funds, supporting a revised state accountability structure, and offering financial support for states to implement the standards. • Provide long-term financial support for the development and implementation of common assessments, teacher and principal professional development, and research to help continually improve the Common Core state standards over time. • Revise and align existing federal education laws with the lessons learned from the best of what works in other nations and from research. 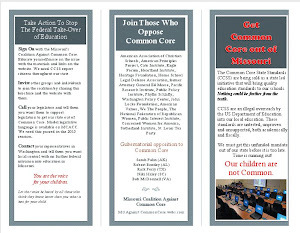 Just because Arne Duncan's signature is not on the state MOUs agreeing to adopt Common Core, do proponents really believe citizens accept the talking point the "the federal government has had no role in the development of the Common Core state standards?" This is a false assertion as the initiative was funded by stimulus money, the Federal government is establishing guidelines the states have to follow, state assessment systems were funded by federal dollars, states will be rewarded (or not) for implementation, and federal laws will be realigned that the states must follow. 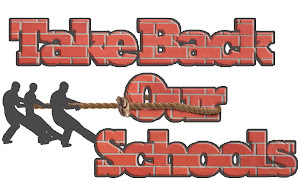 If you are attending the Househearing on Monday, May 13 at noon for SB210 to require the Commissioner of Education to hold statewide meetings on CCSS, listen for the proponents to state "there is no federal involvement". Hand the chairman a copy of McGraw-Hill’s report highlighted with evidence of the Federal Government's fingerprints on CCSS initiatives and development. You gotta love their logic. Let's see, we don't have to get legislative approval for CC because it is stimulus money, but the federal gov isn't paying for CC. It is imperative to support SB210 to require DESE to address this type of disconnect present in the talking points of CCSS.